The legal community and business world are moving to digital formats. Presentation Group’s Litigation Scanning Department can help transform your paper documents into more efficient and organized digital imagery. With our experienced and professional staff, we are equipped to handle any size project. We are a full service Litigation Support Company and offer all aspects of scanning and e-discovery services. If you have any questions about these services or would like to get started on your next project give us a call today. We specialize and have extensive experience in handling litigation scanning from small to large scale document productions. We can image your legal paper documents into a variety of files formats with features as, organized file folder structures, OCR, code, and endorse with electronic Bates numbers. 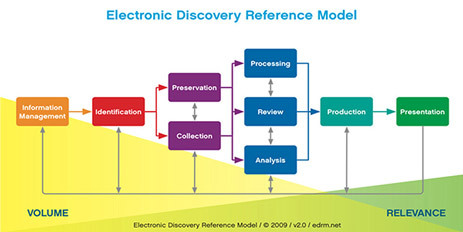 The software we use is designed for high volume production scanning and e-discovery processing with specific functionality to meet special litigation imaging needs such as creating load files for popular litigation software programs (Summation, Concordance, Caselogistix, Sanction, Trial Director, CaseMap, etc.) The native files and images can be hosted in our OnDemand® document repository. If you prefer paper discovery or production, Presentation Group provides high-speed, batch printing of your images to hard-copy. We can provide document breaks and binding to match the original images and color slip sheets with printed information such as document name, bates number range, other document or coded information to help organize the documents. Many law firms have realized the benefits of electronic documents and have converted their paper into digital form. Let us transform your archived files into electronic images to be easily viewed, distributed, and retrieved, saving time and costs. Give us a call and let us show you the cost savings of archiving your files today. In addition to our Canon, Xerox and Fujitsu multi-functional and desktop scanners, we have two large format scanners that can scan documents up to 36” wide in black & white or color. This enables us to scan oversize maps, blueprints, and engineering drawings. We can convert current image documents to and from various digital formats such as TIFF, Adobe PDF, JPEG, PNG, Text or other. With our software, we can also batch convert native file documents such as emails, Word, Excel, PowerPoint, etc. to uniform image documents in TIFF or Adobe PDF formats. OCR (Optical Character Recognition) is a process whereby text is extracted from an image following scanning, giving users the ability to search for key words or phrases. We advise our customers, however that OCR conversion is not always 100% accurate. Results are based on the quality and type of original documents, and whether or not handwriting is present. We can create searchable Adobe PDF documents or provide separate text files linked to scanned TIFF images. We can apply electronic bates numbering with custom prefixes and suffixes to your documents, as well as endorse documents with custom headers/footers such as “Confidential” stamps or exhibit stickers. Our quality control process and scanning software checks to ensure there are no duplicates, overlaps or gaps in the numbering. We offer several coding and indexing solutions for all your document organization needs, including in-house coding and lower cost off-shore coding alternatives through our outsourcing partners. • High Level Coding: We offer capture or input of simple file folder or box level indexing, from source of documents to simple bibliographic and keyword coding about the overall document set. • Objective Coding: Bibliographic fields such as Date, Author, Document Type, Recipients, etc., can be coded from scanned images and exported to include in load files for various litigation databases used for reviewing and searching. • Subjective Coding: We also provide coding of more complex information requiring interpretation of data such as issue codes, subjective details, keyword information, responsiveness, privilege, or confidential designations, etc. Scanned images are furnished on either CD/DVD media or on an external hard-drive, depending on the size of the project. We can also FTP or Dropbox your files directly to your account if login parameters are furnished or even email the files if the file size is small enough.